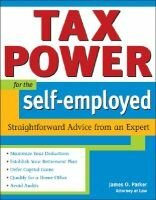 Tax Power for the Self-Employed gives you the indispensable tools to take the money you make from your business, side job or favorite hobby and meet the demands of the IRS. Learn exactly what you need to do to qualify for more deductions, to maximize more credits and to start saving money-today! Everything you need is provided in useful checklists for immediate access. Avoid audits, keep on top of current tax laws and stay out of trouble. Let a tax law expert with over twenty-five years of experience be your personal advisor. Make smart decisions to maximize your deductions, credits and exemptions that will save you money. See exactly what you need to fulfill your duties to the IRS.